Wander down Wairarapa way these days and you’re bound to find a message in a bottle. The message is that local wine buffs, cellar dwellers and connoisseurs have discovered the world’s newest form of ambrosia in a glass – pinot noir. In recent years, major plantings of pinot noir have sprung up in Marlborough, Nelson, Waipara, Central Otago and Martinborough. What makes Martinborough special is the fact that this charming ‘old world’ village is the hub of around forty boutique vineyards. There are no big commercial players here, so you get to sample superior handcrafted wines and buy them direct from the winemaker himself. The premium wines you sample in the tasting rooms, or over a wholesome country-style lunch in a leafy vineyard cafe, are generally so exclusive that they will rarely be seen on wine shop shelves. This is the message I pick up as I amble around the quiet streets of John Martin’s pioneer town. Its worldly thoroughfares – streets named after New York, Venice and Dublin, are laid out in the patriotic form of the Union Jack flag. I have come to Martinborough for a ‘hands-on’ experience of the vigneron’s most tempting treasures from the cellars. I learn that there is a fountain of fine wine flowing through the region, but the elegant pinot noir is leading by a nose. This is more than enough to tickle my taste buds. I leave the comfortable Parehua Country Estate mounted on a solid, reliable, classic Raleigh bicycle, in company with three other passionate peddlers. We explore the village in its peaceful morning mode, admiring the craft shops, fashion boutiques, wine centre, cheese shop and the old Martinborough Hotel, a classic colonial public house. Cycling the Lower Wairarapa byways is a carefree, stress-releasing activity. The expansive plains are quilted in green and yellow, seamlessly joined by orderly shelterbelts and neat hedges. Ranks of tethered vines march in unison towards the hills, each leafy top sprouting darling buds and miniature grape clusters. We pass neat colonial villas with rose blooms entwined around chamfered veranda posts and picket fences festooned with peonies. Our destination today is not the distant hills; it’s simply the bottom of a wine glass. We turn off into The Cabbage Tree vineyard and are instantly fascinated by the vivid orange poppies along each row of vines. Owner David Bull explains that the poppies are not just aesthetically pleasing but also help reduce the excess nutriment in the soil. The stony riverbed terraces of the Wairarapa floodplain provide the perfect terroir for growing low-yielding, rich, concentrated grape varieties. Our mini-fleet of classic cycles later turns into the Palliser Estate vineyard. Picnic lunches are unpacked and laid out on a table in the leafy courtyard. Choosing a wine to complement our repast is not difficult. The happy fusion of climate, terroir and vintner’s passion has produced an outstanding 2006 pinot noir with a delicious palate. Remarkably, a century ago the Wairarapa settlers voted solidly for Prohibition and pulled out all their vines. This resulted in a sixty year hiatus for the region’s enthusiastic winemakers who had to wait until 1970 to replant. Now there are no impediments to progress in wine making, and no limit to the international accolades for the region’s superb varietals. The signature variety of pinot noir is now 53% of total production, followed by sauvignon blanc, chardonnay and pinot gris. Our leisurely tour of this mini-Burgundy, the North Island’s coolest wine region, proceeds eastwards to Vynfields to sample a glorious blend called the Red Rooster. One unknown red variety here comes from five rows of vines that were not identified when the property changed hands. The identity is a tantalising mystery but there’s no doubt about the superb quality and taste. At Alana Estate we sample Alsace-style riesling and a sauvignon blanc that rivals the best of the Marlborough region. When the bottle is opened, the fruit comes out to meet you. This is followed by a lively 2005 pinot noir. Our bicycle wicker baskets are put to good use carrying bottles of this classic Wairarapa wine in take-home packs. The ‘glistening waters’ for which the Wairarapa is known have turned into a fountain of fine wine in recent years, and the perky little pinot is leading by a nose. 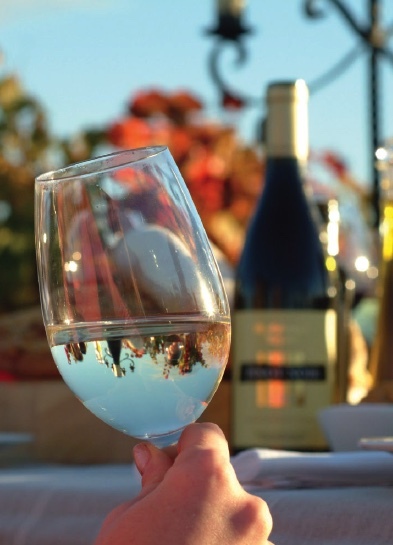 There’s more than enough ambrosia here to tickle the taste buds of wine buffs and first-time tasters alike. I came to Martinborough with grape expectations and was amply rewarded with some hands-on experience of the most tantalising treasures from the cellars. It just took a little ‘footwork’ to pedal for the perfect pinot. Martinborough is one hour’s drive from Wellington over the Rimutaka Hill. There is a wide range of motels, hotels and B&B’s for overnight stays. Normally around 21 wine cellars are open for public tastings and wine sales. 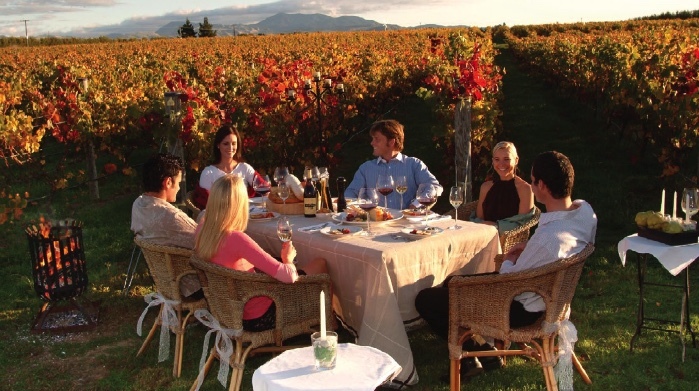 Martinborough Wine Tours offer one-day personally-crafted itineraries for wine and food lovers. 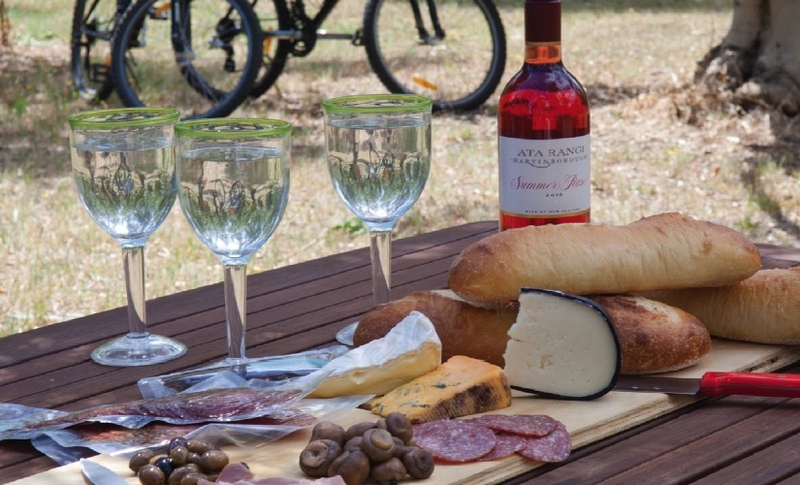 Tranzit Tours offer the Martinborough Gourmet Wine Tour – a full-day guided tour with train transport from Wellington – includes a gourmet lunch in the village. Cycling the vines is easy on wide country roads. 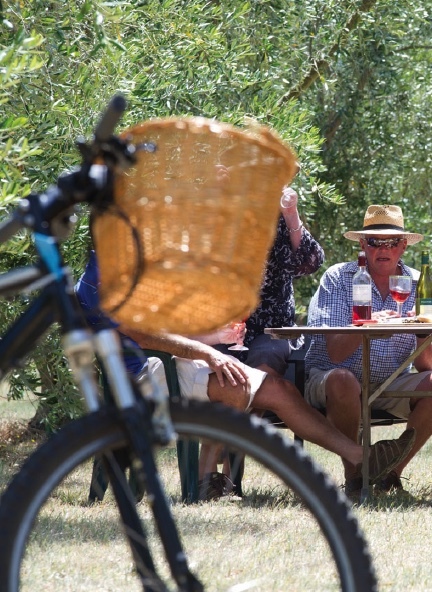 There are several bike hire options including March Hare Cycling which includes a gourmet picnic in the hire charge.